Cycling enthusiasts in the district are calling for a mile-and-a-half long derelict train tunnel to be transformed into Europe’s longest underground cycleway. Built in the 1880s, the Queensbury Tunnel provided a link between Queensbury and Bradford, but has been closed since the 1960s. 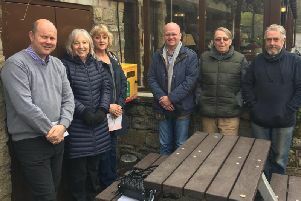 An online petition has been launched by the Queensbury Community Heritage Partnership, a group worried that planned repairs to the tunnel will see it permantly blocked to cyclists and horseriders. Norah McWilliam hopes the petition will pursuade the Highways Agency to change their plans, she said: “They will put the tunnel out of use as a throughway. “All we’re asking is that the repairs are done with concrete sleeves rather than pillars so as to leave a passage through. National charity Sustrans have been the lead organisation in the development of the Great Northern Railway Trail and are backing the campaign and have seen successes with a similiar project in Bath and Earlsheaton near Dewsbury. .
David Hall, Sustrans regional director for Yorkshire and Humber, said: “Queensbury Tunnel is currently the subject of extensive planned maintenance which may result in closing off any opportunity in the future to provide public access through the tunnel to the Great Northern Railway Trail from Calderdale.